Custom House Address Plaque with Carved Oak Leaves & Acorns - - hanging sign includes your property name (or family name) as well. 22" x 22" square. 1-sided hanging sign. Made in USA. 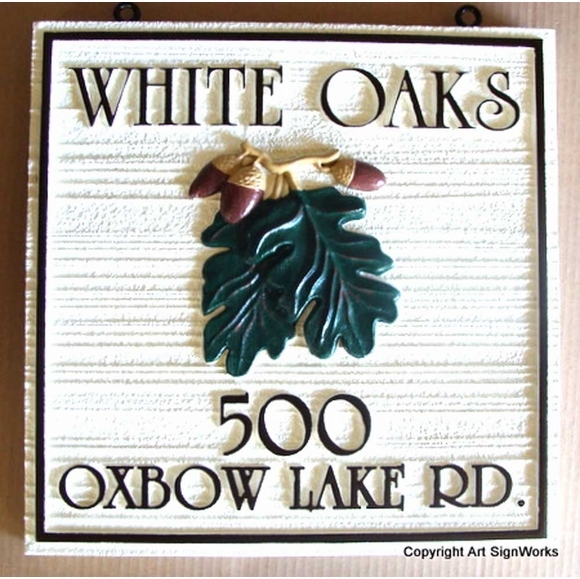 Property name entrance sign features an oak leaf and acorn cluster carved in 3-D. This distinctive and multi-color sign has a sandblasted wood grain texture background. Green, white, and black paint give the sign a clean but natural look. The sign is finished with two coats of clear-coat to protect against UV and the weather. Personalized with the name you supply above the oak leaves, the house number below the oak leaves, and the street name on the bottom of the plaque. Name line holds up to ten (10) characters. House number line holds up to ten (10) characters. Includes loops for hanging from your own post or bracket. Dimensions: 22"W x 22"H x 1.5" thick. Property name shown in this sign: WHITE OAKS. Address shown: 500 OXBOW LAKE RD. Century Club Key Chain - 100 Rides, 100 Ounces, 100 Contacts, etc.